Posted on December 5, 2016 by Norwich Radical	in Community and tagged bus, bus company, bus service, clause 21, commuters, eoin clarke, external, first bus, IPPR, liberalisation, nationalise, neoliberal, norfolk, norwich, Norwich Labour Party, privitisation, profit, public ownership, rail, renationalise, shareholders, transport act, we own it. It’s the 30th anniversary year of buses being deregulated and privatised by the then Thatcher government under the legislation of the Transport Act 1985. Privatisation was supposed to bring greater efficiency to the bus network, give commuters choice, and aid in cutting fares. It has however failed as a policy. It is time that local councils take back control of the bus network, and renationalise to make it publicly owned, and publicly accountable to those who use it. Éoin Clarke posed a fundamental policy question concerning transport: why we should reconsider the merits of privatisation of our bus and rail network? In this article I’m going to focus on buses. Instead of focusing on shareholder profits, a municipal-owned nationalised network can reinvest the profits back into the network which would mean greater efficiency, cheaper fares, and more accountability on how it is run by placing the control of the service into the hands of the local authority in question. Since deregulation it’s quoted that bus journeys outside of our capital city have fallen by 32.5% since 1986 but within the capital they have risen by 99%. There is a fundamental reason as to why this disparity exists — the bus network in London is regulated by the Transport for London, thereby there’s a degree of municipal control on fares and regulation of routes. As quoted by the website We Own It, “Research shows that public ownership of buses would save us £506 million a year that could be reinvested in better services and lower fares. In some cities (and in other countries) buses are already run for people not profit so we know it can be done”. Each year private bus companies are making fares higher above the rate of inflation, adding cost to the commuter. 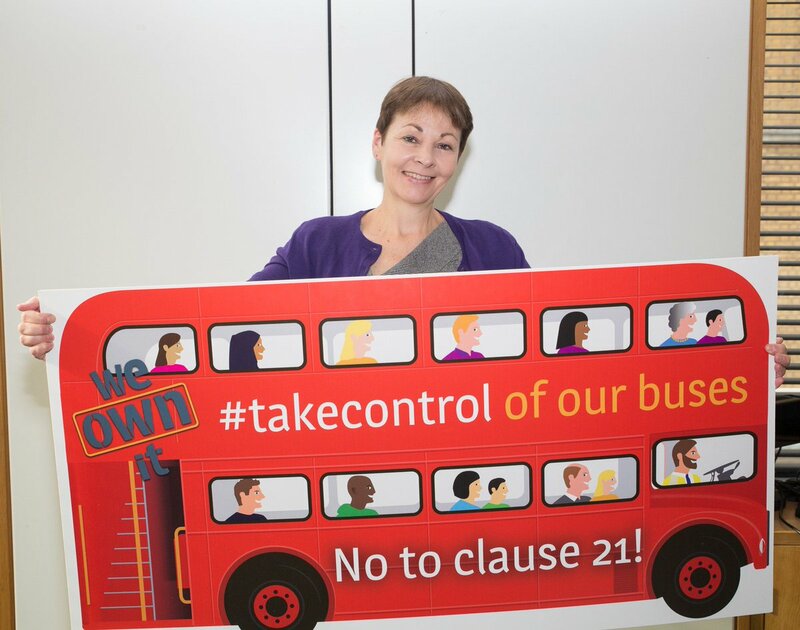 Members of Parliament who care about public transport and for the need to bring it back under public ownership should be taking steps to stop the ban this Conservative government is trying to impose on English councils who want to set up their own bus companies. It’s worth pointing out that there are 12 municipal owned bus companies that are running as a commercial success, and their very existence are being threatened. This attempt of banning municipal bus companies is based on neo-liberal ideology, and a belief in the infallibility of the market. As we already know by our railways, privatisation has been an unmitigated disaster. Let’s not have the same thing happen to our bus network. As we already know by our railways, privatisation has been an unmitigated disaster. As bus fares have increased considerably there is a need for local authorities to take back ownership and control the bus networks. While there is some competition between the bus companies, this is not what I would call true competition. The main bus company is First Buses which is a multinational company operating on two continents with controlling interests in the Greyhound Bus Company, as well as the Yellow School Bus Network, both of which are in the US. Therefore this multinational company, considering its size, is able to seek a competitive advantage in our city’s bus network and thus distort competition. This means fares are higher than they should be and at times we are unable to get the frequency and the capacity needed. For those of you who may indeed be sceptical about the claim there is not true competition, I will take you down to the quote from a transport think tank below to see for yourself. IPPR thinktank, Greasing the Wheels: Supporting and Improving Britain’s Rail and Bus Services, quoted in The Guardian has stated that bus deregulation outside of London has been a failure: “Liberalisation has not resulted in a competitive market — 37 per cent of weekly services outside London do not face any effective head-to-head competiton and just 1 per cent of weekly services face effective head-to-head competition over all or most of their route”. I for one, advocate an alternative model based upon public ownership. This model makes financial sense to both the taxpayer, the commuter, businesses and those who wish to use public transport. With regards to Norwich, I would propose that if the Norwich Labour Party, who are part of the executive and ruling party in Norwich City Council, are true to their socialist roots then they would be seriously considering this option. It is my opinion, that Norwich City Council should take back control of the bus network by nationalisation of the existing buses and networks and create a publicly owned ‘Norwich Bus Company’ accountable to Norwich City Council. A municipal-owned bus company would be accountable only to the people of Norwich and not the shareholders. The prices would be cheaper, the routes will be re-regulated, and there be more capacity in the form of double-deckers on the routes in question. It’s a win-win situation for the commuter and for Norwich as a whole.